Benjamin of Mackinac | Visit our store! 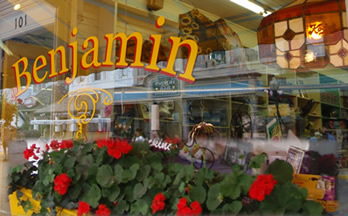 Visit Benjamin Photo & Gift Shop on your next trip to Mackinac Island! Our shop is located on Main Street between the ferry lines. Benjamin Kodak opened in 1950, has been a favorite of tourists and locals looking for quality gifts. We features a wide variety of affordable cameras and photography supplies, books of local interest including histories of Mackinac written by Robert E. Benjamin, jewelry, mugs, tee-shirts and greeting cards for all occasions. There is also our own line of Mackinac postcards which make fine souvenirs of Mackinac. Our friendly employees will share their knowledge of cameras and Mackinac with visitors. Open May through October. 9:00 a.m. until 6:00 p.m.
June-August open until 9:00 p.m.